Severin Film’s ongoing series of Bruno Mattei releases is giving the director a rare spotlight for North American audiences who’ve never heard of this maestro’s of knock-offs, and connoisseurs will no doubt be delighted his work is appearing in uncut versions, mastered from superior source materials, but what constitutes a classic is really in the eyes of the beholder. 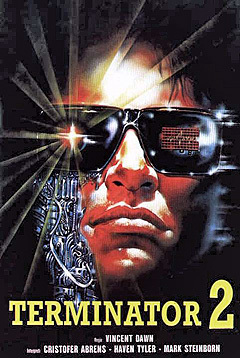 Mattei made a trio of rip-offs between 1987-1989, and Shocking Dark (aka Terminator 2) shows the results when the budget is too tiny for even a director known for explosive scenes and plenty of flying bullet casings. Screenwriters Claudio Fragasso and Rossella Drudi pilfered material from James Cameron’s Aliens (1986) and The Terminator (1984), and their stark ‘homages’ are often jaw-dropping, plus heightened by a cast that by and large lacks needed gravitas. Part 2 will cover Mattei’s other late-1980s rip-offs Strike Commando (1987) and Robowar (1988), but coming shortly is a lengthy podcast interview with Viva Amiga director Zach Weddington, plus a review of Blue Denim (1959) from Twilight Time.